The new HP Latex R2000 Printer. HP Inc. is calling the world debut of its new Latex R2000 Printer a milestone achievement. The R2000 was unveiled today at the FESPA Global Print Expo in Berlin, and coupled with the new HP Latex White Ink – which helps printers deliver the glossiest white on transparent and coloured media – Joan Pérez Pericot, general manager for HP Large Format Graphics Business, says the company has responded to a popular customer request. “HP developed this breakthrough technology based on print service providers continued request for an HP Latex printer to print on both rigid and flexible materials using our water-based inks,” Pericot said in a statement. While citing a photo merchandising report from Infotrend that says the market for large photo merchandising grew seven per cent in 2017, HP also unveiled its new DesignJet Z Printer series, the new HP DesignJet Z6 and Z9+ Printer. The two are available in 24- and 44-inch formats, and offer print service providers a broad range of graphics and technical applications, says Guayente Sanmartin, general manager and global head of HP large format design and printing. HP Inc. unveiled its new DesignJet Z Printer series at the FESPA Global Print Expo. “We thoughtfully designed the new printers to deliver impressive photo quality without compromising time resources and output speeds with the new vertical trimmer and innovative color technologies,” she says. As of press time, Canadian availability and pricing was not yet available. HP says the HP Latex R2000 Printer will be available in June, but will vary by country. According to the company’s website, the HP DesignJet Z6, Z6x10, and Z9+ Printers are expected to be available on June 1, 2018. 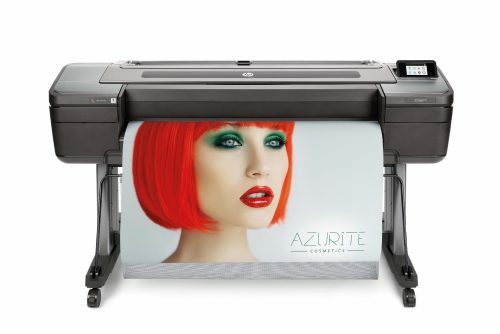 The 44-inch HP DesignJet Z6 and Z9+ with dual roll and vertical trimmer are expected to be available on July 1, 2018.